All DETHS candidates are nominated by their respective Chapters. Most honor society memberships are student-sponsored. 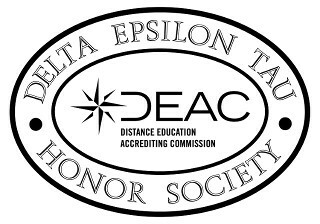 Institutions send potential candidates an invitation and membership application (provided by the Delta Epsilon Tau Honor Society). Students mail their applications and fees directly to DETHS. Within a few weeks, all DET Honors are mailed directly to each outstanding student. Approximately every two months, each institution receives a complete report (Excel spreadsheet) listing the students that joined their respective Chapters. Honor Society Gold Key – To accompany the certificates, each honor graduate also receives the Delta Epsilon Tau Gold Key. Professionally die struck, sandblasted and polished, each Gold Key bears the Greek letters for DET. For presentation purposes, each Gold Key is handsomely profiled in its own case. The emblem, a gold key or badge, may be worn with pride by those who have been elected to membership. This emblem bears the Greek letters for DET, the Flaming Torch and two of the finest words in any language—Integrity and Excellence. The Flaming Torch represents the light of continuous learning. The light serves as a guide, meaning that you are guided by the light of learning and are yourself a guide to others. This image or symbol of knowledge illustrates the significant value of lifelong learning, which for many adults now enrolled in distance education institutions, includes continued learning while earning. Congratulatory Letters – Each Honor graduate receives a special congratulatory letter from the Honor Society. Honor Society Narrative & Overview – Each Honor graduate receives a narrative and overview about the Society.